In the Reports section of this issue, we address several reports on Climate Smart Agriculture (CSA), and raise questions about its efficacy. Here we address another approach to farming that shares the same initials, CSA. Community Supported Agriculture (CSA) is a partnership between farmers and consumers where the responsibilities, risks, and rewards of farming are shared. It is an economic model for production and distribution of food. 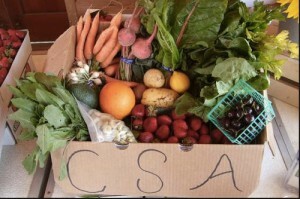 CSA is part of the movement to produce and share food on a local basis. Often members of the community buy a share and get a basket or box of produce periodically in exchange. The farmer gets a secure source of revenue, and gets connected to the community, while the community gets locally produced and fresh food and some security about where their food is coming from. Many CSAs farm just vegetables but others are engaged with producing eggs, fruits, pork, lamb, and beef. Some are now trying CSA with fish. And of course the CSA can rely just on organic food. The partnerships can take different forms, including where a farmer offers a share of production in return for a fixed subscription, or where a farming enterprise is set up and owned by the community which shares in the labor and where the produce is consumed by the community and/or sold to others. Of course there are risks since it is a shared arrangement. Members of the CSA pay their cost at the beginning of the season which provides up-front support for the farmer and then the members receive their pay-out in produce during the harvesting season. If weather or other conditions negatively impact the harvest, typically the CSA members do not get a refund. Determine if there are any Community Supported Agriculture groups in your area and what the arrangements are to join. Find a CSA and anaylse its economic costs and benefits and determine whether the participants are satisfied with the arrangements. If there are no CSAs in your area, explore the possibility of starting one in your area.